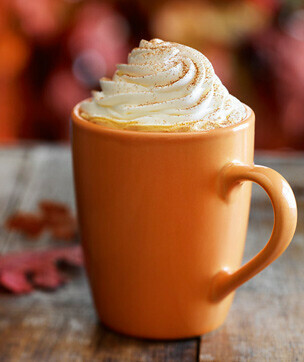 Pumpkin Spice Latte from Starbucks. Emily did an ode to the Pumkin Spice latte here. Krispy Screme donuts…yum! How cute is the pumpkin glazed donut…makes you almost not want to eat it…NOT! 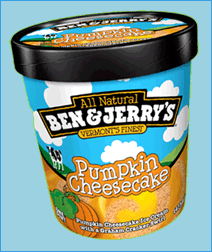 Ben & Jerry’s Pumpkin Cheesecake icecream. I mean…I love cheesecake, but mixed together is delish! What’s your favorite pumpkin food? oh yea Baby. we're going to KK for a dozen of those pumpkin glaze donuts tommorrow night. KK started business in winston salem nc in the late 30's. When I was a kid in the 70's my dad took us to watch the donuts coming down the conveyor belt, then years later I took my kids and now my grown kid takes me lol.. they are super fresh and yummy. My daughter and I had one of the pumpkin donuts today. Super yummy and we didn't think twice about eating that cute face. I like pumpkin pie and that's it – I can't eat pumpkin in anything else – especially coffee, it freaks me out.